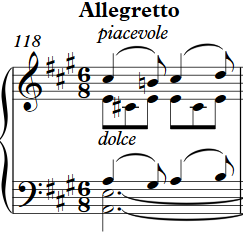 The upbeat = e (not used by Mozart) must not be played as belonging to the following melody. Is with "noble decorum�, easily and evenly, to" sing ". 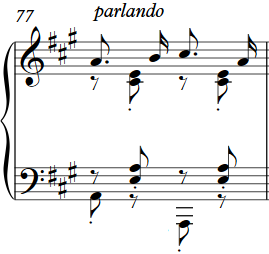 "Parlando" (speaking): Where this term is as expression text, there is (as in "declamato" and "recitando") the notion of a word-text of the intended execution required. 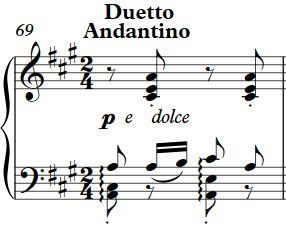 Liszt applied this principle also as a composer, as for example in his Dante Symphony, in which the main themes are quotes from the 'Divine Comedy translated into Music.�For translation of vocal pieces is the original text here given.�This "parlando" refers to the response of Zerlina. The �Piacevole" pleasing, should also be an easily-joyful play to the audience (that is watching at the same time). 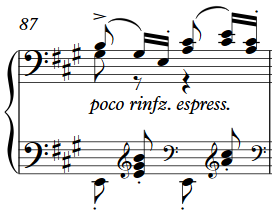 Notably this applies for the Scherzando postscript. 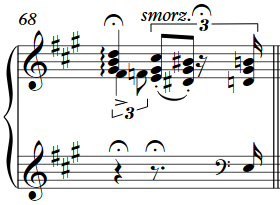 Orchestra part which should be distinct from the Sung, and to be played without pedal. 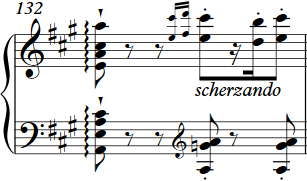 The "Scherzando" should be played absolutely strict, the dance rhythm tempo without fluctuation.�Therefore measure the speed of the scale, so that the first three of them fall exactly on the center of the bar, the later precisely on the upbeat.